Annie O’Neill has it all – a cosy Manhattan apartment, a beautiful bookshop and a network of supportive friends. But at the heart of her life is a hole – a place vacated by her father when he died in her childhood. So when a mysterious man named Forrester enters the shop and claims to be her father’s oldest friend she jumps at the chance to find out more of her own past. But he’s not being free with the answers she needs. He’s much more interested in telling her a story about a ruthless ganglord and a fifty year old betrayal. A bona-fide page turner. What initially appears to be a rather simple, almost pedestrian tale of loneliness-into-love soon becomes increasingly complex and, simultaneously, more frenetically paced. Told with élan and an eye for personal nuance that paints an extremely vivid, moving picture of the human condition, Ghostheart is a superb tale of tragedy and revenge. Big Issue This is a cinematic, sentimental novel with the page-turning power of Stephen King. The second novel by Roger Jon Ellory is every bit as engaging as his first, Candlemoth. I was absolutely enthralled with this novel and I finished it off in pretty much one sitting. Whilst I started to figure out what was happening, it wasn’t until the very end that it completely fell into place, and I think it will need to be read again to pick up on all the clues that I missed on the first read through. GHOSTHEART is an introspective novel of the past, the present, the future, revenge, hate, and most of all, unconditional love. The mystery? What is in each chapter of the past and how does this change the present? Many of the sentences through GHOSTHEART are so thought-provoking that the reader actually has to re-read the sentence so as to not miss the mastery of the ideas so perfectly captured. This book is beautifully written, and Roger Jon Ellory is definitely a talented author who has just written a modern day classic. This is one book that a reviewer is hesitant to write too much about since that could give too much of the mystery away to a reader. I won’t do that. Definitely, unquestionably, read GHOSTHEART. Ellory’s second book shows he is a writer to watch…[his] characters are fresh, his prose is mature…an original and riveting book. Shots Magazine Ghostheart has real bite, and just this wonderful poetic poignancy. It’s a fascinating story. It’s just a fantastic book to settle down into a chair and spend, three, four hours with. 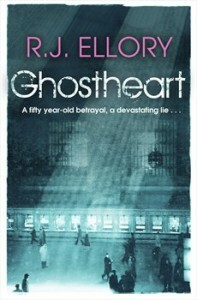 Ghostheart by Roger Jon Ellory lives up to the expectations raised by his first novel, Candlemoth. This compelling novel, with its shock dénouement, is both beautifully written and skilfully crafted and confirms Ellory as one of crime fiction’s new stars. Roger Jon Ellory displayed his remarkable knowledge of modern history in his first novel CANDLEMOTH. It was a memorable work and I predict his second full length book, GHOSTHEART will remain in the reader’s memory an equal length of time. Ellory has the happy facility for taking a past era and bringing it to life in the reader’s mind’s eye. Essentially, this is a book about relationships, trust, loyalty and betrayal, all told against the background of the modern history of Europe and the United States. The writing is beautifully evocative and unhurried. Ellory’s knowledge gives him the potential to write an authentic tale, a potential he fulfils admirably. The mystery is engaging and although I guessed the key part of it well before the revelation, the final chapter contains a surprise and a beautifully ironic conclusion. One can hope that Mr. Ellory can maintain the standard of the quality of his writing in future novels. Looking at the cover of his first, Candlemoth, which shows two boys playing on the sand, you might have expected a tender relationship novel. But it was a tragic, hard-hitting tale told from Death Row. This (Ghostheart) is about the tough crime world of 50s gangland New York, but again, you’d never guess it from the cover. I think he is terrific, an author well worth watching and recommending.